Nigeria-Based International Center Wins Africa Food Prize 2018! Adesanya Omotomiwa and Omooba Temitope are involved in the IITA's youth agripreneurs program. Being able to accept the 2018 Africa Food Prize today on behalf of the International Institute of Tropical Agriculture (IITA) comes with immense pride. For more than 50 years, IITA has been breeding improved crops for Africa, from drought-tolerant maize to vitamin-A enriched cassava. These crop improvements have an estimated market value of US $17 billion going back into the African economy. Publicly funded agricultural research centers, referred to as the CGIAR System , have a long history of improving crops and animals around the world to enhance nutrition and livelihoods and create more sustainable food systems. But as we look to the future, we know that we must cultivate more than these commodities if we are to achieve our mission. We must also cultivate people – especially the 1.2 billion young men and women in developing countries. In fact, around 90 per cent of the world’s young people today live in countries like these, mostly in rural areas where meaningful employment and entrepreneurial opportunities are limited. Yet often, rural young people are poorly understood in research compared to more ‘visible’ groups such as urban youth. Their levels of unemployment remain startlingly high and are driving the rise in urbanisation, migration and political insecurity. But it does not need to be this way. Rural jobs, both on-farm and off-farm, have the potential to attract these young people in the coming decades – not in traditional “subsistence levels” roles but in lucrative ways which anchor rural communities and connect them more fluidly to their urban counterparts. Examples of how young, so-called “agripreneurs” can transform African economies are abundant. With funding from the African Development Bank, technology and innovation centers are being set up across the continent to support their entry into specific commodity value chains, and to act as incubators for youth-led agribusiness start-ups. Young participants in the program like Mercy Wakawa from Borno State in Nigeria have gone on to establish thriving agribusinesses. After not being able to find a job before joining the programme, Wakawa’s groundnut processing enterprise now employs other young people from the area. She and her peers are examples of the new generation of young agricultural entrepreneurs who are stimulating local rural economies for the future. Innovation platforms are being set up to mentor y oung farmers like twenty-three-year-old Stanley Muriuki how to incorporate good agricultural practices, and provide quality inputs and equipment. Stanley saw a ten-fold increase in his potato yield, netting his team the Royal Youth group a profit of almost US $3,000 in one season. As farmers’ profits grow, so do entrepreneurial opportunities in supplying farm inputs, like fertilizer or crop protection to keep farmers and their crops safe from poisons like aflatoxin. 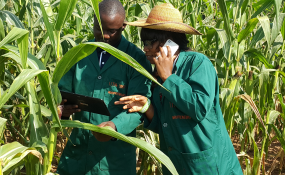 IITA recently launched a natural product called Aflasafe, which controls aflatoxin in maize and groundnuts, and now has the goal of distributing it at scale. Thirty-year-old Victoria Ayeni, who has been a youth agripreneur for five years, is now in charge of after sales and logistics for the distribution of Aflasafe in West Africa. This is no minor role, given that in 2017, demand for the product was over 1,000 tons in six countries. At the farm level, young people are also helping to modernize traditional agriculture, by introducing small-scale mechanization . Twenty-four-year-old Beyene Abebe in Ethiopia saw a business opportunity in becoming a mechanization services provider, providing a two-wheeled tractor to over 200 households annually. Twenty-eight-year-old Gift Chawara from Zimbabwe opted instead to train to operate a mechanized sheller, which earned his youth group just under $7,000 last season, shelling maize kernels for 150 neighboring farms. These agricultural jobs help young people like Beyene and Gift create the stable livelihoods required to allow other farm family members to stay in education, or find work in off-farm employment. Only through providing dynamic employment, and improving livelihoods, can we ensure Africa’s growing youth population becomes an asset, not a burden. As political instability and extremism stalk the continent, creating job opportunities for rural youth will act as a powerful antidote to these threats. The shift is already under way from agriculture being seen as a series of commodities alone, toward being seen as a whole ecosystem, that has people at its center. These spin-off, youth-in-agribusiness programs are now leading the change in mindset by showing the opportunities that exist in agriculture, and the way forward in ensuring food security and nutrition for all Africans. If we continue to succeed in enhancing the role of youth within this ecosystem, the future for Africa will be bright.